Where have all our leaders gone! 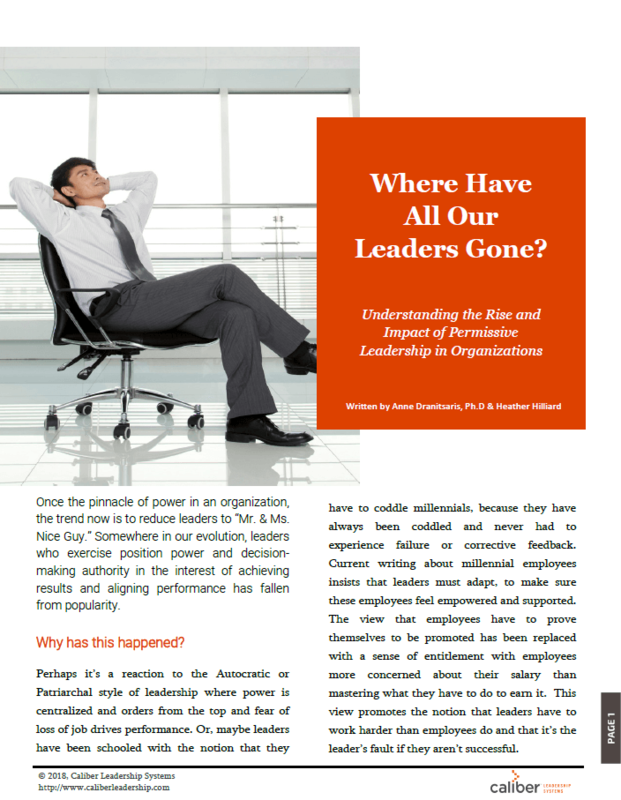 Once the pinnacle of power in an organization, now the trend is to reduce leaders to “Mr. & Ms. Nice Guy.” Somewhere in our evolution, leaders who exercise position power and decision-making authority in the interest of achieving results and aligning performance has fallen from popularity. Why has this happened? Perhaps it’s a reaction to the Autocratic or Patriarchal style of leadership where power is centralized and orders from the top and fear of loss of job drives performance. Or having been schooled with the notion that you have to coddle millennials, because they have always been coddled and have never had to experience failure or corrective feedback. Current writing about millennial employees insists that leaders must adapt, to make sure these employees feel empowered and supportive. The view that employees must prove themselves to be promoted has been replaced with a sense of entitlement with employees more concerned about their salary than mastering what they must do to earn it. This view further promotes the notion that leaders should work harder than the employee does and that it’s the leader’s fault if they aren’t happy, motivated or successful. The burden seems to have fallen onto the shoulders of leaders to be parents, career counsellors, cheerleaders, and caretakers whose mission is to support their employee’s success. The new reality is that empowering people is a leadership responsibility, not the responsibility of employees to gain confidence and trust through mastery and performance excellence. This has engendered Permissive Leaders who resist their natural impulse to assert themselves and lead, instead muting their power and fearing the emotions and reactions of their employees by expecting them to step up. It seems like the perfect approach for entrepreneurs in fast growing companies…..
And it is initially. 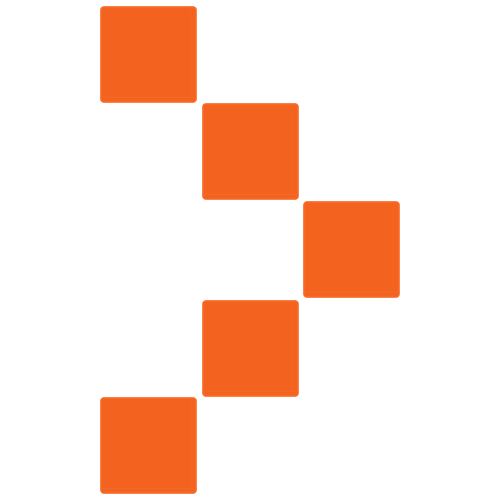 Not having centralized power or clearly defined roles keeps a growing company agile. An environment where everyone has a seat at the table allows for the building of a cohesive group of people to align behind a vision. The permissive leader, usually will little experience or education on how to lead people, gives away too much. They allow employees to take liberties and make decisions because initially, the business needs them to. However, they tend to allow too much, believing that people will give back for everything that has been given to them. It’s upsetting when they realize the employees they have enabled want more given to them and tend to be in it for themselves, not for the business. For example, a tech start-up company whose founder made his entire leadership team feel like they were partners and sought their counsel on all important decisions. As the company grew, it became inefficient for him to do so and he sought external counsel on how to meet the growing needs of the business. Once the founder started making decisions on his own, holding his leaders accountable for objectives and asserting his decision-making authority, everything from apathy to rebelliousness resulted. Most thought he should consult them before defining his business model and vision for the company because he never did before. Some of the leaders on his executive left, because they recognized they weren’t competent to do the job, or they were asked to leave because they refused to adapt and grow with the company. They wanted things to stay the same. Like the Laissez Faire Leadership Style, Permissive Leadership is hands-off. The leader allows employees the freedom to perform to their goals with the minimal of interactions. It is an extremely passive approach where resources are offered but decision making is done by the employees. While this type of leadership is effective for long time employees who have reached the pinnacle of their role and career, it is not effective for the developing employee. Permissive leadership is the equivalent of asking a child for their input on how the household budget should be run or telling them to cook dinner without showing them how to cook or going through the recipe with them. It isn’t leading, it’s abdicating leadership authority. The Permissive Leadership Style isn’t authentic leader behavior, it’s self-protective. A couple of the main reasons for it is a lack of confidence in one’s interpersonal leadership skills because of a lack of training. Another is low self-esteem; leaders who identify with having the “Imposter Syndrome” because they don’t know how to use their inner authority effectively. It’s also a result of having been sent fear-based messages like “You have to give employees what they need, or they’ll leave.” Or “You have to be nicer to your employees or they won’t do what you want.” “Be careful! You don’t want to overwhelm people by asking too much of them.” Well, chances are that if an employee doesn’t want to stick around, they won’t anyway or if you are “nice” employees will say no and won’t do what you want anyway. When we are permissive, we treat our employees like fragile children who are not motivated on their own to stretch and strive for excellence. Our experience is that most employees, regardless of what generation they come from, want and need effective leadership to help them succeed in their role and in their career. Get the tools you need to break bad leadership habits that come from a lack of proper training and support. There’s a Leadership Crisis Afoot! Get amazing result from your people, increase your impact & heighten your satisfaction as a LEADER! 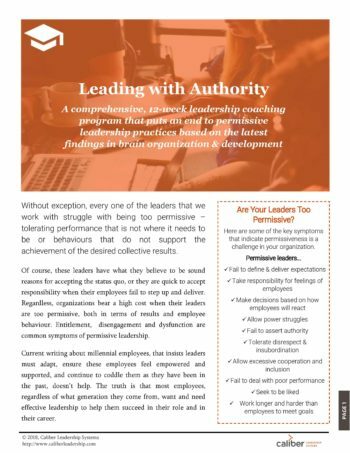 A comprehensive, 12-week leadership coaching program that puts an end to permissive leadership practices based on the latest findings in brain organization & development.